It’s been a while since I shared a Try it! post, hasn’t it? I’m going to try to get back into the habit from now on. 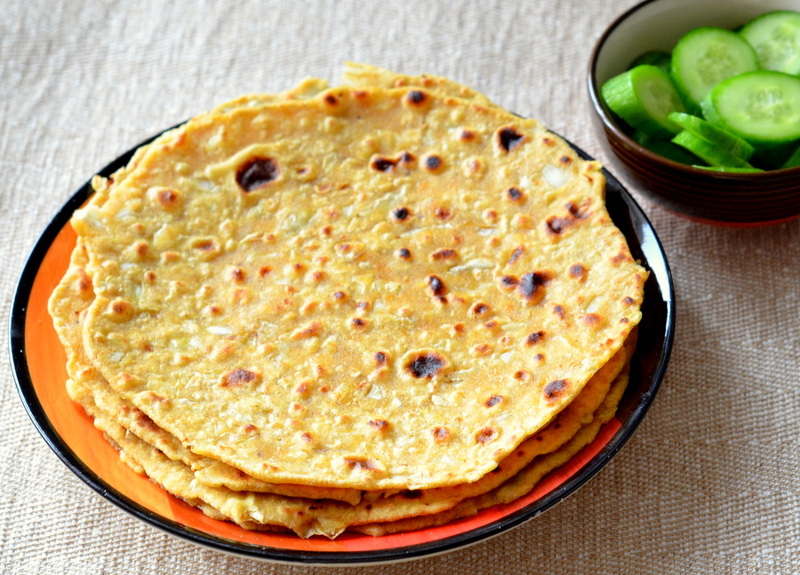 I picked an easy but tasty one to start with – Cabbage Paratha, one of the many, many recipes from Cooking with SJ. I like the idea of paratha’s where the ‘stuffing’ ingredients are just mixed directly into the dough. They’re much easier to roll out than the ones where you have to keep the stuffing separate, then roll out a dough, put the stuffing inside, bunch the rolled out dough like a bag around the stuffing and then roll it out again – that’s too much skill! This, on the other hand, is really easy and tasty. I left out the yoghurt and the oil while making the dough but used a light drizzle of oil on each paratha while it was heating on the pan. I didn’t have Kasuri Methi powder so I skipped that too, though I think it would have been a nice addition. I think my cabbage was a much lighter green than Shruti’s so the parathas didn’t look as pretty as hers with the green flecks but it was yum all the same! If you are intolerant to gluten, I think you will be able to use the same recipe with your gluten-free flour to make these parathas. This looks great, Priya! I’d probably eat a whole stack of them! Yum! Thanks for the ideas on variations for this, Shaheena! Will definitely try them out! Sorry to hear that you are diabetic but it’s awesome that you are figuring out ways of eating healthy and still getting to eat the things that you are used to! All the best. Looks so good! When I was visiting India, I ended up eating parathas pretty much every day — starting to miss it now 😛 The other thing that I was having with every meal was fresh chapati, which I’ve totally been craving. I need to get my hands on some chapati flower! Yum!! I am making an Indian curried cauliflower dish for dinner tonight, and this will make a perfect side! What a cool idea to use cabbage, I don’t think I’ve ever seen that before. Also your photo is beautiful, just pinned it! It’s so cool that you’re taking those classes, Violet! Aloo was a favourite paratha when I was younger, mostly because I hadn’t heard of or tasted any others! Now-a-days people are getting so creative with what they put into their parathas! 🙂 Good luck with your classes and paratha making! Thanks Priya! 🙂 Maybe if I get really good at making paratha, I’ll be creative too. hehe Which is your favourite paratha??? I love parathas. Just made them for the first time about a week and a half ago. Never seen them with cabbage. Love the idea. I’ll be doing these ones next. It was my first attempt at cabbage ones too! Hope it turns out a success! Good luck, Stacy! You are great at supporting your co bloggers Priya! It indeed is well tried dish :). Omg! I tried making cabbage paratha last night and it was a disaster! I’ll try again with this recipe!